We’ve already talked about a few of the things that you can do to save money when you’re moving. That was a while, ago, though, so we thought it that–since that first post went over well–it might be nice to revisit the topic. So! Without further ado, here are a few more (and hopefully more creative) things you can do to reduce the cost of your move. Obviously you’re going to be sorting through your stuff before you move. 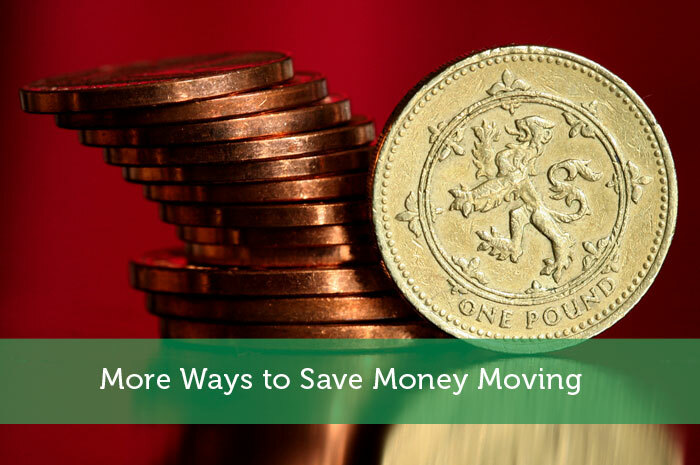 If you really want to save money on moving costs, though, you need to keep as little as possible. A good rule of thumb is that if you haven’t used it at least once in the last year and/or totally forgot you had it, you can get rid of it without too much fuss. Another option is to only move the things you use once every six months and put everything else in storage. Yes, it will hurt to get rid of that dress you wore in high school that you hope will be stylish again soon but it will hurt less to sell it to a kid who calls it vintage, than to hike up the cost of your move, right? And, like we mentioned in our previous post: you can sell anything you’re not taking with you and use the money you make from the sale to offset your moving costs. It’s true: you can often save money by doing your entire move yourself. But remember: the moving vans you rent often wind up costing more in gas, mileage and fees than you would pay for professional movers to take your stuff from point A to point B.
It’s also important, if you are thinking of dividing your belongings between your new home and a storage space, to try and find a moving company that offers both. That way you might be able to work out a “package” deal and reduce your costs even further. You’re already getting rid of lots of stuff and putting lots more things in storage, why not go full minimalist and move into a smaller space? Smaller apartments and houses cost less money to rent and buy. They are cheaper to heat and cool and often require less maintenance. If you’re selling a current home, moving to a smaller house will allow you to use more of the profit from the sale of one house and reduce the amount of the mortgage you’ll need to afford the new place. You can also save money by selling a house and then renting for a year or so. Apartments are cheaper than houses and, more often than not, the cost of utilities (some of them anyway) and maintenance are included in the rental fees. This is a particularly good idea if credit is an issue or if you are selling a house in one town and moving to a completely new city. Really, the only thing limiting the amount of ways there are to save money on a move is your own creativity. There are lots of things that you can do to cut costs. You just have to be inventive! Sometimes renting the smallest van is a waste of money because you need to drive back and forth more, losing time and gas money in the process. Maximizing every means can really help us save money and get what we pay for. I agree with you the bigger van is better but still it depends on our needs which matter the most. I recently downsized my home and was able to get a 3.5% mortgage. It’s a good thing too because my daughter is now 15 and getting more expensive every year! So true about your creativity being your only roadblock in coming up with ways to save money. They might not all pan out, but the more you think outside the box, the more ideas you will come up with. Eventually, a few of those ideas will stick. Shopping around for quotes is essential! When I moved last year I got quotes as high as $2000 to as low as $350! I actually went with the $350 quote (they had a lot of good reviews) and had a super smooth move. If I had just went with the first guys who quoted me $2K that would have been terrible. So get quotes and read reviews. My wife and I are in the process of rightsizing. Over the past 15 years or so we have managed to accumulate a ton of stuff that we simply no longer need (or want). Hopefully we can sell some of it to help offset some of our moving costs. Love this entry Adam. I’d just like to add that if you’re looking to take the moving yourself route, you can save on boxes by going to any large retail store, grocery, or liquor store and asking if they have any extra in their back-room. Most stores will be happy to oblige and can offer more varieties in size and dimensions than those of the UPS variety.